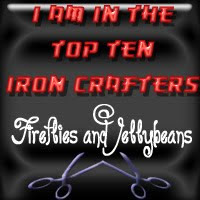 Twelve Crafts Till Christmas: i am a top ten iron crafter! So apparently my obsession with recycled cans paid off. (And trust me, I was obsessed!) Because today as I was browsing the plethora (oh, I love that word) of blogs I follow on Google reader, I found out that my soda can jewelry made it into the top ten for the Iron Crafter Challenge over at Fireflies and Jellybeans. And there's more . . . if enough people like my soda can jewelry and vote here on Fireflies and Jellybeans, I could actually win an advertising spot on Fireflies and Jellybeans. To be honest, I didn't actually think this far advance when I entered the challenge. I'm not sure what exactly I would do with free advertising, but if, by some fluke, I would win one of the top three spots, I would think of something quick . . . ASAP. Someone suggested that I just put my button in the spot, but my button is kind of sad looking. I'm proud of it, but it's not exactly the best advertising look. Just get on over there, vote, be inspired and . . . Congrats!! I'm heading over to vote now. Yay for you! i'm voting right now! wow! love this project. Can't wait to make some for friends. You are awesome!! !